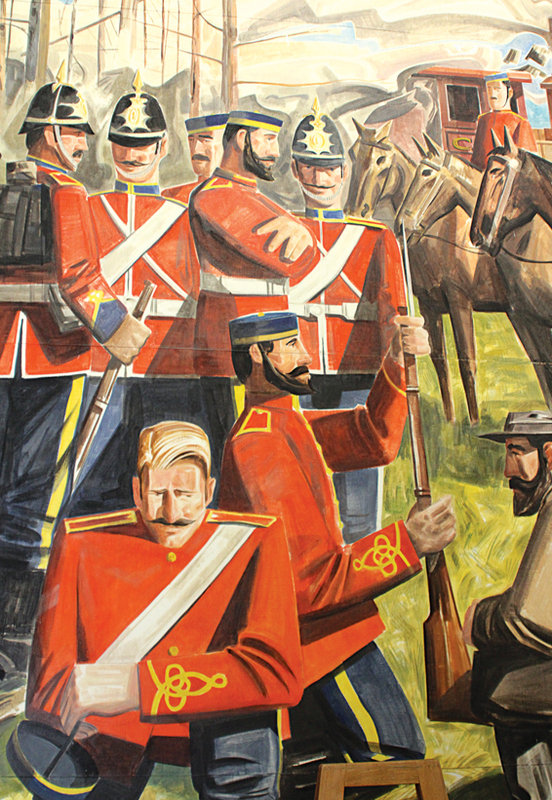 A painting of the North West Mounted Police by Kenneth Lochhead is one of Regina Branch’s many murals tracing uniformed military history. Regina Branch may be a shadow of its old self, but what a shadow it still casts. The 2,000-square-metre classical moderne-style building was constructed in the heydays after the Second World War, when the branch had more than 2,500 members. Princess (now Queen) Elizabeth and the Duke of Edinburgh attended the official opening in 1951. Boasting an auditorium, cafeteria, lounge, museum, offices and all the storage room the branch would ever need, the place was hopping for decades. Over the years, membership declined, utility costs skyrocketed and in the new millennium, the branch found itself with more building than it could afford. Several schemes for saving it fell through, and eventually the branch was forced to sell to a developer who wanted to put up a parking garage. Still, walking along Cornwall Street, you would hardly know of the trauma. A generation ago, parts of the building were designated a Municipal Heritage Property. The Tyndall stone memorial tower, stained-glass windows, the coat of arms worked in terrazzo tile flooring, the two-storey murals lining the interior of the grand foyer and the wrought-iron gates have been saved. But the great doors that used to open onto the auditorium are forever closed. Behind them is the parkade. The branch vacated the building in 2013 to make way for demolition of the back of the building, construction of the parkade and restoration of the front interior. When the branch reopened in 2015, as a rent-free tenant for 10 years, it was with a new attitude. 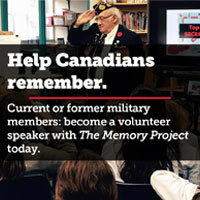 Branch programs and services continue—it raised $150,000 in poppy fund donations in 2017, the veterans’ visitation program continues, the service officer is still busy, Decoration Day and Remembrance Day programs and other commemorative events are still planned. But, said Eskdale, “there’s more emphasis on running it as a business.” The Vimy Lounge and Dieppe Café, renovated with an eye to attracting downtown workers, fund branch expenses, and the executive is focused on attracting customers as well as members. “We have to be part of this downtown movement,” said vice-president Gloria Evans, who is also responsible for communications, part of which is keeping up the branch’s social media presence. The cenotaph and a popular city park are just a block away, and members work hard to attract people back to the branch for a meal, a drink or a visit to the military museum following public functions. Once crammed into smaller space, the museum now stretches over the entire top floor. Exhibit space encompasses the old building’s foyer with murals by Kenneth Lochhead tracing Saskatchewan’s military history from the Northwest Rebellion, through the Second South African War, the world wars and into postwar remembrance. A new three-metre by seven-metre mural by artist Mary-Ann Dubé was being painted over the summer. “The theme is 100-plus years of the Princess Patricia’s Canadian Light Infantry, with an emphasis on modern veterans and Afghanistan,” said curator Ron Hitchcock. Vignettes of individuals will be featured against a backdrop of the theatre of war, said Dubé. The museum concentrates on telling the stories of the men and women who made Saskatchewan’s military history. “There’s a story behind every artifact,” said museum volunteer Mack Howat, who begins a tour focusing on one soldier. Private George Polson served in the 46th Saskatchewan Battalion “infamously known as the suicide battalion,” because it had a casualty rate of 91.5 per cent. Polson survived, but he earned a wound stripe. The museum has his pay book, medals and uniform—complete with a “sweetheart pin” meant to be given to a loved one. There are artifacts from every era, including museum volunteer Dale Welta’s favourite—a quilt reportedly from the War of 1812, with squares of cloth from soldiers’ uniforms, made by a woman who is said to have lost five sons in the war. In the Memorial Tower is a chapel with five stained-glass windows, a Cross of Sacrifice and Books of Remembrance. A display honouring the Salvation Army may be unique in the country. “The Salvation Army was present in every armed conflict to provide pastoral care, hot meals and amenities,” Howat said. Exhibits highlight the contributions of individuals, which build the overarching story of the contributions of the army, navy and air force. There are the two Chamberlain brothers who set off for the First World War, but only one returned; Lieutenant-Commander John Quinn, the only Saskatchewan navy member listed in the Korean War Book of Remembrance, killed by shore batteries while serving train-busting duty on HMCS Iroquois; and the 21 airmen lost in a crash near Estevan in 1946. Moving on to more recent history, there is a tribute to helicopter pilot Captain Juli-Ann Mackenzie from Weyburn, killed in 2002 in a crash near Goose Bay, N.L., while returning from a search-and-rescue mission. The tour may be over, but new exhibits are planned honouring cadets and documenting the history of the branch itself. “A museum is never finished,” said Howat.